Unfortunately, no matter how well you take care of your teeth, there may come a day when you need a filling due to a cavity. 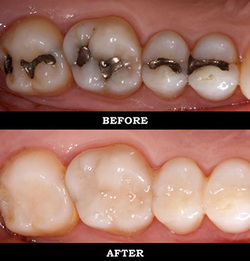 The good news: the age of black mercury fillings and crowns that show gray at the gum line is over! Modern dentistry allows us to replace old mercury fillings with tooth colored fillings that are stronger, safer, and more natural looking.